If you've been looking for a Hackamore with Braided Leather Nose Band with Fancy Engraved Shanks you came to the right place. This specific model of Hackamore happens to be one of our best sellers due the it's impeccable craftsmanship and affordable pricing. 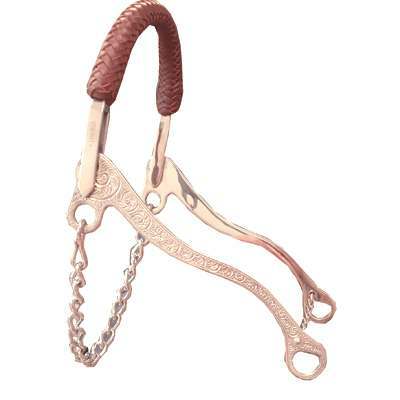 This beautiful Horse Hackamore comes with fancy engraved shanks. The size of the shanks are 9''. These Horse Hackamores also come with a braided leather nose band for style and comfort for your Horse. When buying a product from us you can rest assured you're getting a top quality product at great pricing.